Candles have been a part of my life since I was a kid. I have a now-fading memory of being barefooted and circling with other children around a huge pot of melted wax, taking turns dipping wicks to make dipped candles– we must have been cute little witchlettes around that huge cauldron of wax! That was when I was about eight years old, at an overnight camp in Vermont. Do I even need to mention that my parents were really hippies, disguised as professionals? Years later, grunge-ness and dressing like an artist were cool. I did my part by making custom pillar candles up in my bedroom. I’d melt wax on an electric hot plate, add dye to it, and pour layers of blue, red, yellows, etc., into handmade molds. The safety issues were overlooked in favor of self-expression, and this activity was a-okay, again, because of the hippie parents. Skip ahead a couple of decades and by now I’ve learned about the different purposes of candles and how I enjoy them the most. I’ve determined that, without a single exception I can think of, you get what you pay for in a scented candle. Up to this point I’ve foolishly assumed that you know all about candles too. But perhaps you have not had as many mishaps (i.e., learning experiences) as I? Let me fix my blunder! Votive. The common usage of “votive” describes a small candle with or without a jar. Sometimes votives are referred to as “tea lights,” and vice versa, although votives and tea lights are technically distinguishable because votives come without a jar while tea lights are in foil or jars, or meant to be placed in jars. Tea lights also get to float around daintily on water. Either way you hear it, just know that a votive or a tea light, is a very small candle. Jar. Jarred candles are the variety I buy most often, I believe most big candle makers sell their goods in this form. Glass jars and wax can both be colored to provide countless options for personalization and decor. They’re a lot less messy than pillars or tapers. Tapers. Tapered candles are the generally tall, thin, candles you see in candelabras, behind church pulpits, in menorahs, or at candle-light vigils. I personally haven’t come across any scented tapers but they are often colored. Multi-wick candles. Some candles have two or more wicks but typically multi-wicks feature 3 or 5 wicks, intended to be lit together. Multiple wicks are used to burn through very large candles, such as Jo Malone’s Deluxe Candles and Diptyque’s outdoors candles. I said that multi-wicks are meant to be burned together. However, you can burn them individually. I experimented by burning just one wick of a three wick candle, and the flame was strong enough to melt a pool around the one wick and not drown in melted wax. But user beware if you don’t want a misshaped or uneven candle! This goes well with my discussion of pitting and tunneling, in the “do’s and don’ts” section. Paraffin. Yes, I’ve doggedly bad-mouthed petroleum. But here I’m going to praise it because without it we would not have paraffin wax. Paraffin wax shows up many things, such as in hair waxing kits, hand spa wax treatments, and waxed paper. While I prefer not to use petroleum or its by-products on my lips and face, paraffin wax is, in my opinion, the best medium for scented candles. Why is it my favorite? In sum, paraffin is hard wax that carries scent and color well and performs in any type of candle form. It has a higher melting point than other waxes or gels, and will leave fewer (or no) perfume grease spots in its packaging. Again, that’s based on my experience and not scientific data. Soy. As opposed to paraffin, soy wax is “natural,” being derived from soy plants. While soy wax sounds earth-loving and tree friendly, etc., I don’t really want it as a base for my scented candles. Perhaps you’ve heard that soy wax is “clean burning” and all that, but I haven’t noticed a difference against paraffin. And most importantly, soy just doesn’t have the ability to grab perfume and throw it off like paraffin. You can see where my priorities lie. Beeswax. Is it just me, or is it such a great word? I think of honey combs and lip balms, and minding your own, when I hear “beeswax.” But I don’t think of scented candles. Beeswax doesn’t often get to be scented and poured into beautiful glass jars! You can of course find Beeswax candles, but notice how they already have their own character and color. If you want a beeswax candle you’ll know it. Side note: A burning beeswax candle somehow smells to me like a donut-shop. This eye sore is a result of too many short burns and a clumsy person or a non-wick trimmer. Yuck. How do I know this? Because it’s happened to me too many times. I used to just cross my fingers that a candle wouldn’t pit, not knowing that it was completely within my control. If you already have a pitted candle, you can re-mediate it somewhat. Here are some techniques: let the pitted candle burn for long enough that the outer wax has softened. With the candle still lit, come from the sides of the flame and push down on the solid wax sides, so that the wick is slowly surrounded by more wax. Just remember that the heat from the flame will burn you if you happen to be above it, but not when you’re right beside it. Stop before the wick is put out by too much rising wax. Allow the surface to level itself out again by liquifying. 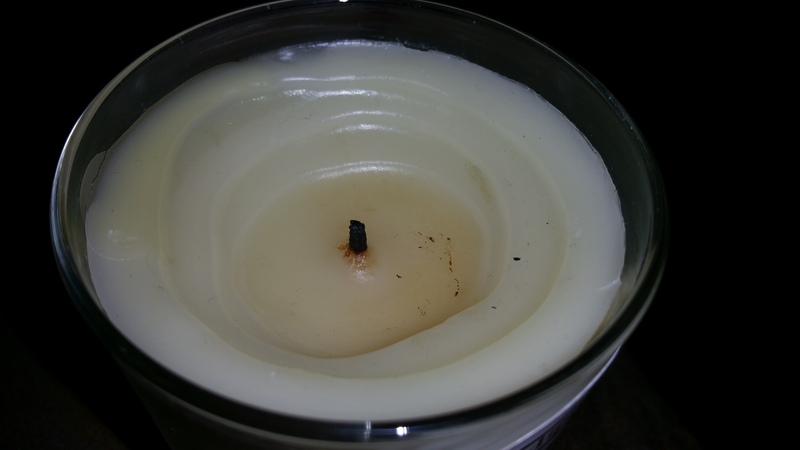 In the alternative, when the wick isn’t lit, use a knife to scrape off the wax around the sides, and save the scrapings. Light the candle and place the scraps evenly around the wick so that they burn and level the surface. Finally, if you’ve tried these methods without avail, try using the candle in a drawer or closet, for its scent. This would work with or without removing the wax from the jar first. If you do have just the scented wax left, put it in some cheesecloth or linen fabric, tie a ribbon around it, and put it in a drawer! Do Trim Your Wicks. You should keep yours wicks at 1/8 – 1/4 inches as a rule. This means, do not light a long black wick that came from your previous burn. I like to trim my wicks almost down to the quick. Read more about this in the accessories section. Don’t Walk. Kind of self explanatory, but don’t walk around with a lit candle unless you want the wax splish-sploshing and dripping. Strictly speaking all you need to burn a candle is a wick, wax or oil, and a flame. But around here we burn candles for pleasure, not for scantily lighting a medieval dungeon. So, we have to accessorize! Wick trimmer. I used to contort scissors every which way to get inside the glass of jarred candles and cut the wicks. I even used to pull off black wicks with my fingers. Just don’t do that unless you want messy fingers and pieces of wick all over the place. I should add onto the “do’s and don’ts” list with: “don’t let black wicks specks fall onto your candle or in melted wax.” That’s just an ugly mess. Plus it’s not precise and could damage your candle if you pull up new wick through the middle accidentally (yes, I’ve done this). A wick trimmer is a nice tool because it fits down inside a jar, where it’s difficult to get a scissor. Most trimmers also hold onto the cut piece of wick for proper disposal. Trimmers come cheap and they come not so cheap. You just need one that works. Candle Snuffers. Okay. As accessories come, this may seem like a silly one. Obviously you or your dog can blow out a candle. The benefit of a snuffer is the reduction in smoke and the decrease in splattered wax from your wind shearing breath. Lids. If you thought candle lids were actually meant to be snuffers you were totally dead wrong. What a faux pas! How could you? Lids are actually for keeping dust and other contaminants out of candles and for decoration. Stands. Photophores. 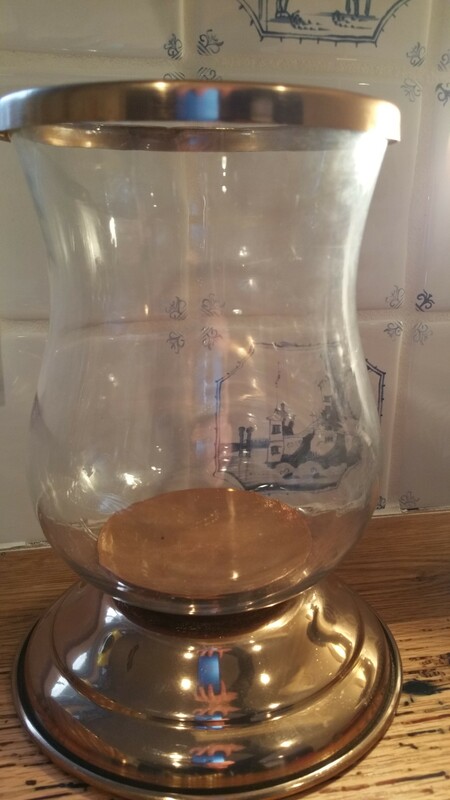 These are purely decorative for jarred candles, but often necessary for tapers. If you haven’t heard of a “photophore,” that’s okay. It’s a fancy 19th century French word (I made up the 19th century part) that describes a glass container, as seen below. Well, I do hope this primer was useful. I aim to teach others through my mis-haps and silly experiments. Do you have any questions? Please, please ask! I can always research it or live it if I don’t already know the answer!